One too many nights drunkenly wandering Los Ramblas street in Barcelona may have you weary of the previously never ending charms of Barcelona. Perhaps this is the travel gods saying to you – take a day trip, change the scenery and come back to Barcelona again and fall in love with it. Below are a few suggestions of places that you can go that are a quick train or bus ride away. Barcelona is wonderful, but Catalonia has other wonders to peddle too. 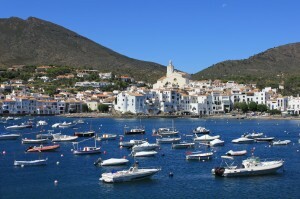 Two hours bus journey up the Mediterranean from Barcelona are the untouched and unspoiled fishing village of Cadaques. This village is storied to be the inspiration for many of the works of Salvador Dali. This village became a refuge for artists and celebrities in the mid 20th century. You can take yourself and see if the inspiration to be creative falls upon you. Nearby to Barcelona is Montserrat’s sedimentary rock. The “Serrated Mountain” was once believed to be the resting place for the Holy Grail. The view from the top provides a breath taking vista view of the Penedes wine valley below. The Penedes valley below has been the Spanish hub of win production since the 9th century. There are more than 66 different producers of wine in the valley including: world famous Frexienet and Cordorniu. Wine tours are and tastings are available. Sitges, situated 30 kilometers from Barcelona, is a small fishing village that surprisingly would become the epicentre of Spain’s counter cultural movement. With 300 sunny days of summer and a beautiful natural park that borders it on all sides this is a location that has all the blessings of nature. The artistic vibe is still alive and well today with many arts fairs and museums devoted to Catalonian artists. Two hours North of Barcelona is the tiny microstate of Andorra. Blessed with Pyrenees skiing, clean air, and advantageous prices and taxes Andorra has long been a favourite location for the French and Spaniards that flank its borders. Interestingly, Andorra also has a variety of health and wellness spas that use the clear waters cascading off of the Pyrenees. Perhaps this is the place to cleanse yourself of all the Barcelona partying. Located 50 miles from Barcelona is world heritage site Tarragona. This area is known as a mixture of cultures and renowned for its remaining Roman infrastructure from over 2,000 years back. A gastronomical dream, Tarragona has become a haven for food lovers. The variety of fresh sea food is unmatched and the region hosts an annual Tapas festival (April 19 – May 6) each year.